The latest market report by PMR on the global plant activators market evaluates the opportunities and current market scenario, and provides insights and updates about the corresponding segments involved in the global plant activators market during the forecast period 2018-2027. The global plant activators market report further exhibits the estimated data for 2018, and forecast data up to 2027, in the terms of value (US$ Mn) and volume (MT). In the terms of value, the global plant activators market is expected to grow at a CAGR of 5.8% over the forecast period. The present study exhibits the trends and market dynamics of the plant activators market in five major regions - North America, Latin America, Europe, Asia Pacific, and the Middle East & Africa. The report also includes the study of the current issues with consumers and various future opportunities in the plant activators market. The report explores the global plant activators market for the period 2018–2027. The primary objective of the global plant activators market report is to provide insights into key developments in the market that are consistently supporting to transform global businesses that are associated with plant activators. It is very important to consider that, in an ever wavering economy, we provide the estimated (Y-o-Y) year-on-year growth rate in addition to the compound annual growth rate (CAGR) for the overall forecast, to understand the better analysis and evaluation of the global plant activators market, and to discover equitable opportunities. Yet another key feature of this report is that, the estimation of the global plant activators market and the corresponding revenue forecast is carried out in terms of absolute dollar opportunity. This is usually not prioritized while forecasting overall market numbers. Absolute dollar opportunity analysis is very essential in evaluating the degree of opportunity that a provider can observe to execute, as well as to contrast the potential resources from a sales perspective in the global plant activators market. The global plant activators market report starts with an elaborated executive summary, and the market definition of various segmentations that are included and their respective shares in the global plant activator market. The report further incorporates the major macroeconomic factors that have an effect over the growth of the plant activators market. The market report also highlights the various market dynamics, which includes the drivers and restraints in the global plant activators market. Current opportunities as well as on-going trends in the plant activators market are also discussed in report. The report further underlines the study of the present issues with industrial processing, and opportunities in the plant activators market. It also encompasses the value chain analysis, which provides a structural view of overall profitability from the manufacturer to the end user of the plant activators market. In order to provide users with a clear view of the global plant activators market, we have exhibited the competitive analysis of key market players and their strategic expansions. The competitive dashboard presents a detailed comparison of plant activator manufacturers on valuable parameters such as key product offerings, total revenue, key developments, and key strategies. The study intensifies the global plant activators market attractiveness analysis by source, form, application, crop, and region. To evaluate the overall market size of plant activators, the report considers various fundamental aspects based on secondary research. Furthermore, it emphasizes quantitative evaluation such as market share by source, form, application, crop, and region, and other qualitative data from primary respondents, which have been consolidated to arrive at clear and accurate market estimations. The market size was benchmarked taking in consideration the share of agricultural land in the total arable land across the globe. The average use of specialty crop protection products deducted from company revenue was used to triangulate the process. The forecast presented in the plant activators market report arrives at the total revenue being generated, and expected revenue contribution in the future by the global plant activators market. Detailed profiles of companies that manufacture plant activators are included in the global plant activators market report to analyze their developmental strategies, key product offerings, and recent developments, as they have a significant role in the market. Market players covered in the plant activators market report are Isagro SpA, BASF SE, Syngenta, Futureco Bioscience S.A., Gowan Company, Certis USA L.L.C., NutriAg Ltd., Plant Health Care, Nihon Nohyaku Co., Ltd., UPL Limited, Excel Crop Care Limited, Jaivik Crop Care LLP, NACL Industries Limited, Koppert B.V., and Agrauxine S.A. The agricultural sector is rapidly changing with increasing developments across the globe. Various markets are emerging in the agricultural sector, with a dominant driver of the increasing demand for food. Decreasing resources and arable land are leading to increased pressure on the demand-supply of agricultural products, which has proved to be a factor for the emergence of new products that can increase agricultural produce. Changing environmental status and climatic conditions, as well as the emergence of various pests and disease outbreaks have a negative impact on the yield and quality of crops. This has drastically increased the demand for crop care and protection products such as plant activators, recently. Plant activators are chemicals that activate plant defense genes by via signal transduction. This activation of genes is essential in order to resist various biotic and abiotic stress conditions such as attacks by pests, insects, or pathogens. Plant activators directly don’t attack the pests or pathogens, but induce a self-defense mechanism in plants so that they can defend themselves against an attack. The global plant activators market is expected to have an attractive absolute dollar opportunity of around US$ 643.8 Mn by 2027 over 2018. The fruits & vegetables segment under crops is expected to have a relatively high CAGR across all the segments in the plant activators market. Asia Pacific is expected to be a prominent region in the global plant activators market during the forecast period, owing to larger and ever-growing agricultural activities in the region. Latin America and North America are also expected to be key regions in plant activator space over the forecast period. By source of plant activators, the synthetic segment is expected to be a prominent segment as compared to the biological segment in terms of value over the forecast period, owing to its increasing effectiveness and multiple benefits. However, the biological segment fares better in the plant activators market in terms of volume, owing to lower prices, ease of use, and fewer hazards. The liquid segment, by form, dominates the market as compared to the dry segment in the plant activators market, due to ease of handling, lesser hazards, and emerging technologies, as well as the increasing preference for foliar spray application. In the global plant activators market, by application of plant activators, the foliar spray segment is expected to be a prominent segment as compared to the others, due to emerging technologies and innovation in sprayers, as well as the large application of plant activators for fruits using foliar sprays. The fruits and vegetable segment, by crop, is a prominent segment in the plant activators market as compared to the rest of the segments, due to increasing demand, as well as the rising problem of resistant pest and disease outbreaks on fruit crops. The increasing demand for crop care and protection products is proving to be a direct driver for the plant activators market. The increasing population, decreasing arable land, and poorer soil quality are proving to be drivers of the plant activators market, since plant activators are expected to increase long-term agricultural productivity and restore soil balance. Increasing pest attacks and the outbreaks of diseases lead to a decrease in the yield of crops. The extensive use of chemical pesticides and fungicides is known to have adverse effects on consumers as well as deteriorate the quality of soil. As such, there is increasing demand for plant activators as an alternative to pesticides and fungicides. Plant activators act by stimulating the natural defense system of a plant, and hence, don’t actually interact with the pathogen or accumulate on the crops. This means that they are harmless as far as the health of consumers are concerned. Evolving species of various pests and pathogens are turning resistant to traditional crop protection solutions. Plant activators are thus used widely to combat resistant pests and pathogens. However, high manufacturing and R&D costs as well as lower awareness in emerging regions are hindering market growth. The global plant activators market is regionally segmented into North America, Latin America, Europe, Asia Pacific, and Middle East & Africa. Regionally, Asia Pacific, North America, and Europe, currently, are prominent regions in the global plant activators market. However, Asia Pacific is expected to show rapid growth and become a comparatively prominent region in the plant activators market over the forecast period. Large-scale agricultural activities in Asia Pacific, with the growing demand for food from India and China, along with the rising awareness among people about the long term benefits of using plant activators are some of the prime factors that are driving the plant activators market in the region. Large and growing fruits & vegetable market in major countries, as well as emerging technological advancements, make Latin America an attractive market for plant activators. 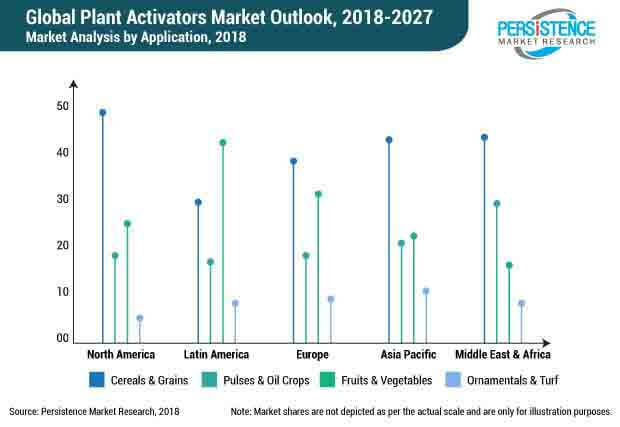 North America and Europe are expected to exhibit steady growth in the global plant activators market, since they are mature markets for food and agricultural products. The Middle East & Africa is expected to exhibit a comparatively lower growth in the plant activators market, due to less agricultural activities in the region as compared to the other parts of the world. With all the factors above, the global plant activator market is expected to have positive growth in terms of volume and value during the forecast period.